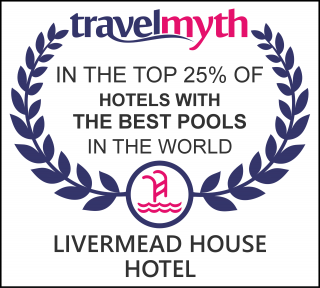 From comfortable dining and social areas, through to our sporting and leisure features, The Livermead House Hotel has excellent facilties. For business and social occasions we have various meeting spaces and suites, along with private dining rooms and a large ballroom. For the general visitor we also have great recreational spaces; we are one of those selected hotels in Torquay with a swimming pool, sauna and gym facilities. On sunny days, our well-maintained grounds are pleasant to roam, take a dip in the pool or simply sit and admire the views. Or alternatively, those who enjoy a game of squash, snooker or indoor bowls will also enjoy our games rooms and other features. Raise a glass or simply enjoy the view. Perfectly relaxing in all seasons. Classic country house grounds, just footsteps from the sea. Perfect for afternoon tea. Take a dip or top up your tan in our delightful outdoor swimming pool. Enjoy some "me time" in our seriously relaxing health facilities. From ballroom dancing to wedding discos, our dancefloor has ample space for all. All the fun of lawn bowls, without the risk of rain stopping play. Ideal for friendly competition and exercise between friends. Enjoy a relaxing round or three of play. Perfect for sociable evenings. Keep in shape and at your best with our gym facilities and equipment.